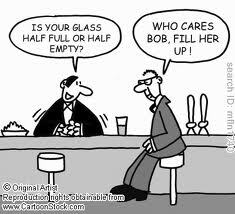 Are you a glass half-full or a glass half-empty kind of person? An optimist or a pessimist? At a personal level, we can choose whether to be optimistic or pessimistic about any situation that confronts us. Optimists tend to make the world a better place, because they believe they can. Pessimists tend not to, because they believe they can’t. But what about the bigger picture? Is the world in general getting better or worse? If we look for problems we will find them. The 20th century brought us world wars; barbarism on an industrial scale; the Depression of the 1930s; and the rise of global terrorism, to name a few. If we look for positives we will find them too. The elimination of many contagious diseases; huge increases in life expectancy; unprecedented falls in global poverty; and the computer and internet revolution. So, is the world getting better or worse? I happen to know the answer, so I’ll tell you. It’s the same as the answer to the glass half-full/half-empty question: we can choose. This entry was posted in Life and tagged Belief, Computers, Economic growth, Environment, Feminism, Freedom, Health, Human rights, Longevity, Poverty, Prediction. Bookmark the permalink.